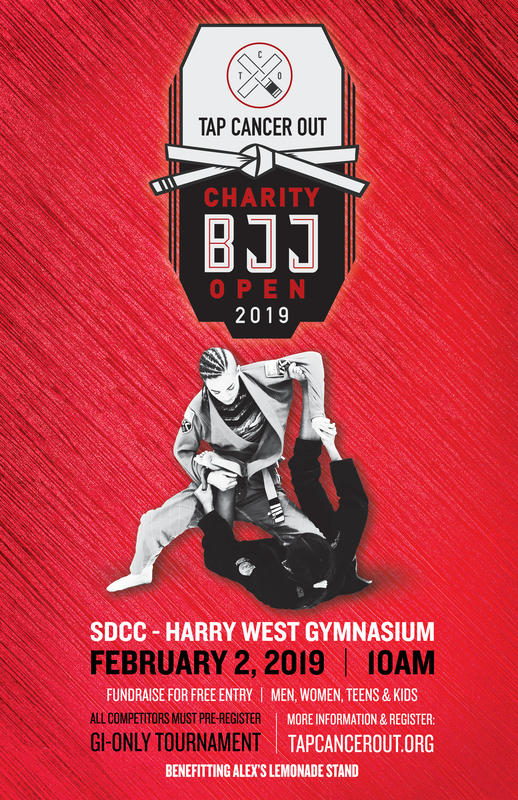 On February 2nd, 2019 we we returned to San Diego, CA, for our fifth annual Tap Cancer Out San Diego BJJ Open! We always love kicking off the year (and escaping the New England winter) in SoCal, and even though it was rainy, we still set records! Adrian Phruksukarn grabbed an early lead for our Top Individual Fundraiser spot and never relinquished it, raising $4,553 in total. Anna Poore earned her her second consecutive Top Children’s Fundraiser title raising $3,280, more than double her total from 2018. This brings Anna’s lifetime fundraising total to an impressive $4,946! The Stronghold raised another $10,568, bringing their lifetime funds raised to more than $46,000, but it was Jiu-Jitsu Foundation that unseated Stronghold as the Top Fundraising Team, raising $11,012 thanks to 12 fundraising competitors. Ultimately 174 transacting fundraisers and 1,510 generous donors helped us raise nearly $80,000 in direct donations—a new record for San Diego. In total, the tournament raised more than $102,000! Special thanks to Cory at GrapplingX for partnering with us again. Our 2019 San Diego BJJ Open raised more than $102,000 in support of Alex’s Lemonade Stand!